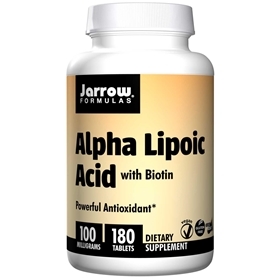 Jarrow FORMULAS Alpha Lipoic Acid is a unique lipid and water soluble antioxidant that is a cofactor in energy production, helping to regulate glucose metabolism. ALA also promotes the synthesis of glutathione. Biotin is an essential cofactor that is important for energy production and lipid metabolism. Biotin is added for optimum ALA activity. Take 1 to 6 tablets per day, preferably with meals or as directed by your qualified health care consultant. Easy-Solv tablets are designed to disintegrate within several minutes of ingestion. NOTE: If you have a medical condition (especially diabetes or being treated for glucose control) or taking medications (especially for glucose control), consult your health care practitioner before using this product. Other Ingredients: Calcium phosphate, cellulose, stearic acid (vegetable source), magnesium stearate (vegetable source), silicon dioxide and vanilla.